Why Is Corrugated Cardboard a Good Insulator? Corrugated cardboard is an inexpensive and efficient material used for packing, protecting and transporting many products. 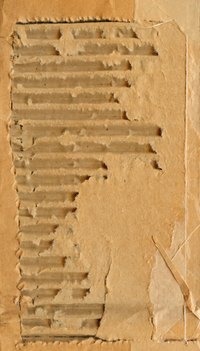 It is made of condensed wood fibers, and the fluted design of the interior layer of paper traps air within the cardboard. These properties make corrugated cardboard a good insulator. Corrugated cardboard consists of an arched, or fluted, layer of heavy paper sandwiched between two thicker, puncture-resistant layers of heavy paper. The resulting material is strengthened by the fluting, which also acts as a cushion when the corrugated cardboard is crushed. The flutes in the central piece of paper are aligned vertically to add strength to the cardboard. Double and triple layers are used for industrial settings, while a fine flute is used in packaging and displays. The Columbia Encyclopedia, Sixth Edition, defines insulation as the use of a material to slow or prevent the conduction of heat or electricity from one object to another. Conduction is the transfer of heat between two objects and is caused by a temperature difference, according to the Dictionary website. Heat insulators include wood, wool, stone, air and fiberglass. Double walls are also used to prevent the transfer of heat from one side to another. Corrugated cardboard is a good insulator because of its double walls and its molecular makeup. Wood is a good insulator because it is a dense material and does not allow the quick transfer of energy. Corrugated cardboard is made up of short, dense wood fibers that restrict the transfer of heat energy. Double walls are used to insulate many things, including refrigerators and coolers. Double walls work well as insulation because air is trapped between the walls. The air trapped between the walls retains its temperature for a long period and thus can keep the interior of the container either hot or cold. Since corrugated cardboard is made up of two layers of paper with fluting in between, air is trapped within the cardboard, thus providing insulation. Heavy-duty corrugated cardboard, with its multiple layers, provides even more insulation than regular cardboard. Double-layer cardboard is made up of three heavy, puncture-resistant layers of paper with two fluted layers sandwiched between them, and triple-layer cardboard consists of four heavy layers of paper with three fluted layers in between. The added layers of paper provide more wood fibers and more pockets of air, resulting in better insulation. The heavier the cardboard, the better its insulation qualities.